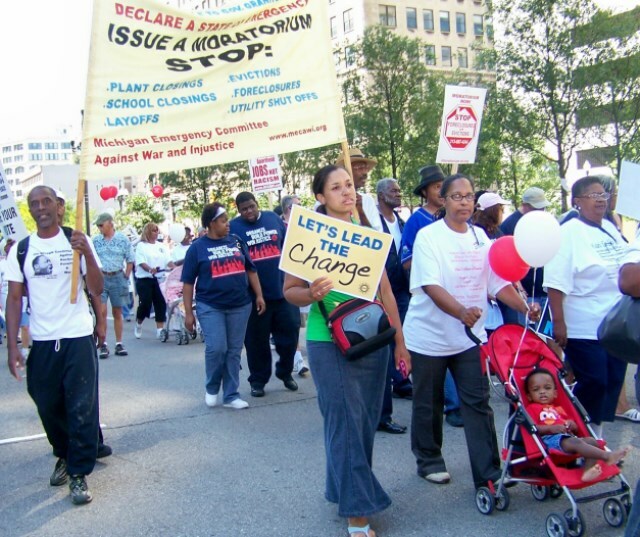 Marchers demand moratorium on foreclosures, evictions and other attacks on the people at march in downtown Detroit Aug. 28, 2012. Alonzo Long, Jr. told police in a statement that he did not fire first, and was defending family members as they moved from tax-foreclosed home. DETROIT – Relatives, friends and community organizers supporting Alonzo Long, Jr., 22, including a half-dozen white high school students, along with relatives and friends of Howard Franklin, 72, and Catherine Franklin, 37, killed by Long Nov. 28, packed the court for the second part of his preliminary exam Jan. 2 in front of 36th District Judge Ruth Carter. Long faces two counts of first-degree (premeditated) murder in the deaths, which he told police resulted from his defense of family members moving possessions from 15114 Piedmont in Rosedale Park. He said they were confronted by the Franklins, both armed. The elder Franklin bought the home at the Wayne County Treasurer’s October tax auction; it was deeded to him Nov 10. “My nephew would never have had the intention to kill anybody, and my sympathy goes out to their family,” a woman who said she was Long’s aunt told VOD. No other family members from either side commented to the media. 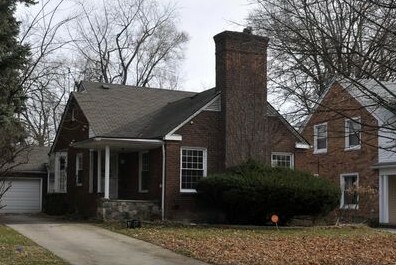 The Piedmont home was owned by Willie and Margaret Fletcher, and occupied by their grandson, according to a county records and a board member of the Rosedale Park community association. He said after the shootings, he took Tamika to the hospital and returned to his home, where he later voluntarily surrendered to police. Home at 15114 Piedmont where shootings occurred Nov. 28, 2014. He said he was sitting in a car outside, and entered the home after his uncle called for him from inside during an apparent argument. He said he did not see the younger Franklin with a gun at first on entering, but did see the elder Franklin with one, putting his hand across his chest to draw it. He said he drew his own gun from a holster and fired at him. All three individuals had concealed weapons permits. 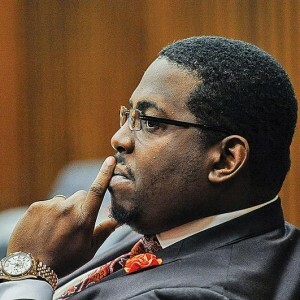 Long’s lawyer Charles Longstreet II objected to admission of the statement because Walton was not present for the entire interrogation and because it was not inclusive of the entire two and one-half hour interview, which was videotaped. This is part of one of three new so-called “sqatters” laws sponsored by conservative State Rep. Kurt Heise (R). Although they criminalize squatting, they also protect some rights of previous owners and their relatives, as well as renters, who are not considered squatters. He also said that sufficient time had not elapsed between the date of the new deed, Nov. 10, and the incident on Nov. 28, for a legal eviction to be carried out. 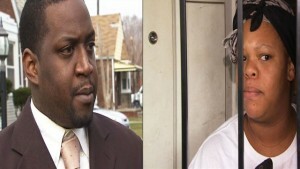 Assistant Wayne County Prosecutor Daniel Williams countered that the occupants were “voluntarily” evicting themselves. He said Howard Franklin had a .38 Special Ruger revolver. He said it had not been fired, since he emptied the gun of five unspent rounds before putting it into evidence. He said the gun was in Franklin’s left side shirt pocket, with the handle protruding. On cross, he said the gun would have to have been taken out of the pocket with Franklin’s right hand, causing his arm to cross his chest. He said he did not examine the woman on the porch. An employee of Catherine Franklin’s testified earlier that she had a gun in her hand when she fell out the front door, mortally wounded. No forensic evidence has been presented. Judge Carter said she would review a two and one-half hour video of the Long interrogation in camera before resumption of the exam and disposition of the case Tues. Jan. 6 at 1 p.m.
After the exam, Mike Shane of the Moratorium NOW Coalition Against Foreclosures, Evictions, and Shut-offs said they and other groups are instituting a city-wide campaign for an immediate moratorium on all tax foreclosures, due in part to the increasingly volatile situation they represent. He said in particular occupied properties should not be sold, and called for the charges against Long to be dismissed. Newly installed Wayne County Executive Warren Evans previously called such a moratorium on mortgage foreclosures during his tenure as Wayne County Sheriff. 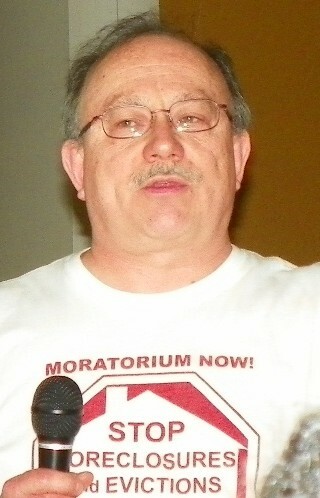 Mike Shane at rally against Detroit banks in 2013. He said the Coalition is approaching 20 community organizations this week to get support for a moratorium. Along with the 15114 Piedmont home, community organizer Agnes Hitchcock said at least 16 others nearby on Piedmont have large past due tax bills, with one foreclosure, one owing for four years, three for three years, and two for two years. All are subject to foreclosure. Confrontations between new owners and occupants are taking place with increasing regularity. Ardmore home where winning bidder Tracey Moore illegally removed everything in the owner-occupied house without court order. One woman told VOD that the home on Ardmore which her husband’s grandmother Faustine Hawkins has occupied since at least 1988 was evidently sold at the October auction. However, Ms. Hawkins had quit claimed the home, where her grandson Keith Dortch spent his entire life, to him in 2012, as shown in county records. Register of Deeds records for both Hawkins and Dortch show no foreclosure action taken against the property. Mrs. Dortch is temporarily in a nursing home recovering from a stroke, but the woman said she is expected to recover and return home. On Nov. 11, the treasurer deeded the house to Tracey Moore of Detroit from the October tax auction. The new so-called “squatter laws” actually provide for compensation to a legitimate occupant for damages three times the original value if they are illegally evicted. 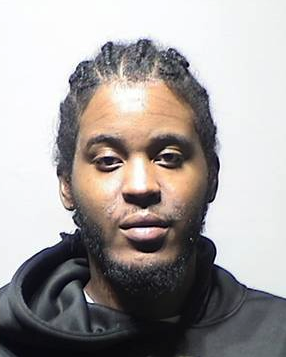 In another case Dec. 9, covered by MyFoxDetroit’s Ronnie Dahl, Detroit police arrested Jamal Gilmer when he went to the house he had just purchased to get the previous owner, Sareena Patterson, to move out. Angry when police told him he could not order Patterson out without a court order, since she had a deed and was not a squatter, he told the police he didn’t need them and approached the house himself. West Outer Drive home bought by 25-year-old winning bidder. 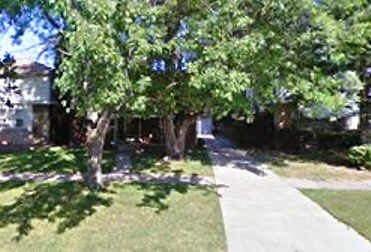 Channel 7 covered another case Dec. 17, in which the new owner, Brittney Harden, 25, who said she paid $50,000 for the West Outer Drive home, claimed the occupants were squatters. 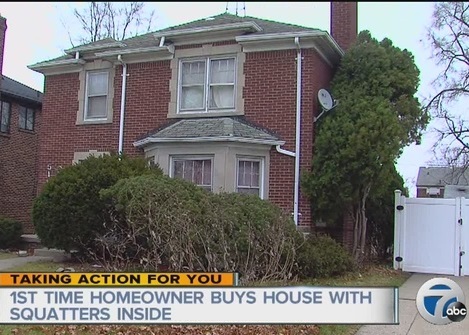 Fox 2 headlined the story asserting that the occupants were indeed squatters. But the so-called “squatter,” a mother of small children, told Dahl that she had rented the house for seven years from the landlord, who lost it in the foreclosure sale. Dahl reported that Harden has now gone to 36th District Court to go through proper eviction procedures. According to Register of Deeds records, Harden herself lost her home to tax foreclosure earlier in the year. For more information, contact the Moratorium NOW! 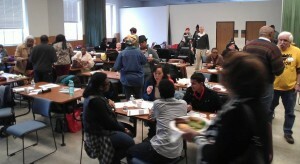 Coalition at http://www.moratorium-mi.org/. New state “squatters” laws at 2014-PA-0223 eviction rights landlord and tenant Heise and 2014-PA-0224 Anti-squatter and 2014-PA-0225 penalties for squatting. I’m appalled that the incident happened at all, and TRULY, TRULY, DEEPLY saddened at not only the loss of life of the two family members, but also the “premeditated murder, charges” of the young man allegedly “defending” his home. THE WAYNE COUNTY TREASURER’S OFFICE & REGISTER OF DEEDS HAS NEGLIGENTLY SET UP THIS DYNAMIC in thousands of instances throughout Wayne County and should also be named as culpable. The Radio and TV advertisement of the Auction(s) is vague to non-existent, pertaining to legalities of winning the bids (Even though a Terms and Conditions packet might have been “accessible”). Deputy Treasurer, David Szymanski acknowledged, on the front pages of Detroit News and Miami Herald in June 2013, “The rules are not being followed”, PRIOR TO SUBSEQUENT, CURRENT & “QUESTIONABLE” AUCTIONS!! The auction contractors, through the Treasurer’s Office and/or Register of Deeds Office, should have at least made the new / potential owners aware of the MI “Castle Doctrine” (which equates to other states “Stand Your Ground Laws”) premised on “A man’s home is his castle” and shall be protected. With that information and knowledge, perhaps, just PERHAPS, these lives would not have been lost!! After all… both parties, unfortunately believed, they were the “RIGHTFUL OWNERS”!! I wonder why Diane Bukowski is trying to muddy the waters. What’s her interest in this case? I was in court last Friday and Long’s statement did not say anything about Howard drawing his gun in fact he stated that Howard had his gun in his hand. That lie could be seen for what it was when the dpd officer got on the stand and said Howard’s gun was in his pocket. And he said he never seen the female with a gun. So how do you defend yourself from someone who has not even pulled their gun? Now Diane Bukowski is trying to deceive you reporting lies as true statements. He took his friend to the hospital, yeah because he shot her too. The fact is Alonzo Long murdered the Franklins because his family could not live there for free anymore. They were stealing shutters and a chandelier, were they going to put that stuff in the new house the decided to squat in? Diane Bukowski called all yall down to court to support Long stating that he was defending his family and the truth is she should have called yall down their to support the Franklins where they lost 2 family members over a chandelier and some shutters. I wonder how long this will stay up. I presume you are a relative of the Franklins. As explained clearly in this story, the house was occupied by the GRANDSON of the owners, the Fletchers. He was NOT squatting. Therefore according to state law specified in the sidebar, the new owners had to obtain a court order to evict him. However, his family members were helping him move anyway. Why did the Franklins bother interfering in this process, carrying guns to the property? Ms. Franklin put her own children in danger of losing their mother by such a rash action. As far as the chandeliers and blinds (as identified in earlier hearing), they likely were installed by the Fletchers, but it is not worth losing one’s life over such petty issues, or shooting anyone else. The police who were on the scene first SHOULD have told the Fletchers to leave the property and go to court, as did the police in the Dec. 9 incident where the new owner was arrested when he disregarded police orders to do so. There has been NO FORENSIC OR BALLISTICS testimony showing whether Ms. Franklins’s gun was fired, and WHO shot Tamika. Were you there? How do you know that Alonzo Long, Jr. shot Tamika? I believe you are speaking from emotion in the loss of your relatives/friends. It was indeed a tragic incident, and I understand the Franklins’ family and friends are mourning. But as Catherine Franklin’s employee testified at the first part of the exam, he told them “It doesn’t have to be like this,” then he and the other employee ran out of the premises to avoid being caught in the crossfire. As far as MY interest in this case, I am a newspaper reporter who knows NONE of the parties involved. I am simply interested in seeing justice done here. From the testimony I have heard so far, Alonzo Long Jr. did not PLAN to kill anyone; he had a CCW so had no police record. Yet he was charged with two counts of first-degree (premeditated) murder. As a community organizer commented in a previous story, he believes that Long’s youth as compared to the ages of the Franklins played a big role in these charges. Chief Craig is out there telling Detroiters, speaking especially to older Detroiters, to arm themselves, and implying that the city is being overrun by criminal youths. Why should the people of Detroit allow themselves to be divided like this, older against younger, when the entire city is under attack from Gov. Snyder and the other forces that have stripped it of its assets?